After eight years on the road an six cd's with X-Legged Sally, Peter Vermeersch thought it was time for a change. After two succesful farewell concerts in Brussels and Tokyo, he fired his musicians and came up right away with a new project : A Group, with a radically different line-up than what is expected from Vermeersch : Peter himself taded his horns for samplers, Pierre Vervloesem his guitar for the bass. XLS-singer Thierry Mondelaers sings and plays guitars, Anne Fontigny sings and plays keyboards, Didier Fontaine drums. 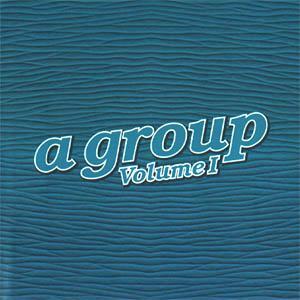 After some try-out concerts, the band went into the studio in November to record with the help of Spence Chrislu, Frank Zappa's soundengineer since the last en years of Franks's existence, a first cd entitled "A Group : Volume 1". Spence recorded, mixed and produced the album and even lent his voice to two of the songs. Apart from an hour long playlist of own compositions (early 80's inspired, technically astonishing), A Group's concerts will always end with a party during which they play covers from The Sparks, Shirley Bassey, The Beatles, de Bourville ... Anything can happen !! Meanwhile, at the end of March, "This Town (ain't big enough for the both of us)" - a Sparks cover - released as a promo-single only, was included in Studio Brussel's playlist and received a lot of airplay on several national radio stations. Peter Vermeersch studied architecture, plays clarinet and tenor saxophone and is nowadays fulltime composing music. In the past, Vermeersch worked with Thierry De Mey on the music for 'Rosas danst Rosas' (choreography by Anne Teresa De Keersmaeker), an experience which led to the creation of the group Maximalist! In 1988 he composed the music for the Wim Vandekeybus performances 'What The Body Does Not Remember' and 'The Weight Of A Hand' (both in collaboration with Thierry De Mey). In 1991 he did his own thing for Vandekeybus' 'Immer Das Selbe Gelogen', in '93 for 'Her Body Doesn't Fit Her Soul'. Vermeersch composional work has also been an important factor in performances by Josse De Pauw, Radeis, Dito Dito, Charlie Degotte, Willy Thomas, José Besprosvany and others. On a purily musical scale he was a founding member of and one of the main composers of Maximalist!, wrote pieces for the Arditti Quartet, Quadro Quartet, the Duke Quartet and Ensemble Musique Nouvelle and played with Union, Fred Firth, Jazzwork From Berlin, The Simpletones, Flat Earth Society. 'The Soluble Fish' (Walpurgis Records) is the title of his first opera project (in collaboration with Ryszard Turbiasz) that premiered in February '94. In April '95 he composed an orchestral suite for a Frank Zappa memorial at de Singel, Antwerp. In september '97 he set-out on rearranging 20 of Belgian rocksinger Arno's songs for a memorable concert with a brassband at Brussels' Botanique. He is now working on pieces for his future big band, The Flat Earth Society, he has started with with 16 fellow musicians. Self-made guitarist Vervloesem joined X-Legged Sally after Michel Delorie's departure in 1989 and was a big influence to the band's sound. Some of the compositions are from his hand. Early nineties he founds 'The Woodentrucks, who gave their first concert exactly two hours before operation 'Desert Storm', release an album on Island / Boucherie, and ... split. Coproduces with Vermeersch the debut albums of dEUS, Mad Dog Loose, Nancy and the album of Vermeersch opera 'The Soluble Fish'. Vervloesem is the proud creator of two soloalbums: 'Home-made' and 'Fiasco' (carbon 7). His next project is his very personal - but orchestral - version of John Barry tunes. Thierry sings and plays guitar in the evenings, and takes care of the Horta museum in Brussels during the day. Didier is one of Belgium's most popular studio drummers: He plays with The Sands, Guy Chadwick and joined dEUS for a four month European tour, replacing the band's ill-struck original drummer. - Café des Arts (De Morgen), December 1998: "The music may at first glance seem more poppier and accessible than that of the late X-Legged Sally, but the way it's meandering in all kinds of directions at once keeps astonishing. Everything seems possible and is permitted in the universe of A Group : the most de manier waarop ze diverse richtingen tegelijk uitwaaiert blijft verbluffend. Alles lijkt te mogen en te kunnen in het universum van A Group : the most unlikely combinations, atmosphers & colours mix & mingle & xollide. Humor is a key to the concept ... I take my hat off for the hotshots at VIAkra, who have brought this masterly record into our reach". - Teek (februari 1999) : "Magnifiying everything in a theatrical manner, that's the path A Group has chosen to walk on. Volume one sounds like a bombastic collection of curiosities by people with too many influences ... An educational radio play for musicologists". Did you see a good (or bad) review of the album ? Send it to me ! Rarely have I heard a band that's so in tune with the "mission statement" of the label that is releasing the album : "VIAKRA, is VIA Records new born label for "not easy to place but fantastic to listen to" music. Started in 1998 with the intention to bring out cd's of bands or artists who create a different kind of music and make a Cross-over in the widest sense possible". Fits exactly. A witness to that is for example the closing song of the record "Woggy-Doggy", in which I consecutively hear : a funfair-organ, Tuxedomoon, medieval folk, Zappa, free-jazz, Led Zeppelin, German Kabaret, the organ of Eugène Flagey, Nurse With Wound, Chic, Talking Heads, Hole, The Beatles and a dog kennel., You would recognize without a doubt a dozen more musical "quotes". Not that all the songs are that eclectic ("Hi Tom" only 50 sec. so is an almost unidimensional campire song, the beatiful "Dumb Lamb" a crossing of The Beautiful South with Mad Dog Loose, "This Town (ain't big enough)" a reasonably faithful Sparks-cover on steroïds), but in most songs of "A Group" there are enough ideas (and half-finished melodies) to fill a little maxi-CD with. There's some skilful music playing going on on this cd (as if that were a quality, just imagine a group filled with 4 times Eric Melaerts and .. shiver), although X-Legged Sally singer Thierry Mondelaers steps out of line from time to time. In short, this is a pop-record much a like the favourite dish of a friend out mine : toast with chocopasta ànd banana-slices. It looks awful, most people will shy away from it, but if you have the guts to taste it you might give in. You can order this CD from a number of locations (prices researched on Janyary 4th, 1999, but nothing guarantees they still are the same when you read this).